Is NYC Punishing Educators Who Advocate for Sports Equity in Schools? High school students and teachers are embracing civil disobedience—and learning the repercussions. 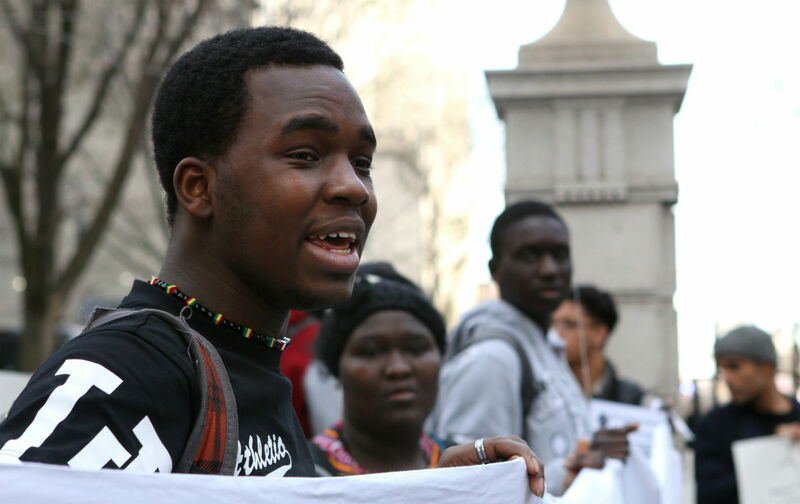 On a recent Wednesday afternoon, about fifteen high school students from the International Community High School (ICHS) in the South Bronx stood at the gates of City Hall, where they plan to stand every Wednesday until their demands are met: sports at their school, and all small schools in New York City. “Chancellor Fariña, you did not read our research. If you did, you would be standing with us and not against us!” belted senior Sory Konate. Other students chanted “Civil rights matter!” to the rhythm of four students drumming on bright orange Home Depot buckets. They stood behind a bright white banner embossed with the image of a clasped black fist and their movement’s social media tag, #civilrightsmatter. Standing by, distributing fliers and keeping an eagle eye out for councilmembers, was David Garcia-Rosen, the man who had been their school dean until March, when he was removed from the school following another action calling for expanded access to sports. Ironically, when he was hired as dean of the school in 2010, Garcia-Rosen made promises to combat problems that plagued the school—gang violence and high dropout rates—by building a sports program. To be admitted to the International Community High School, a public school, students need to have been in America for four years or fewer. The students are from a wide range of countries, many with volatile political scenes such as Togo and Yemen. Ninety-four percent of students were English language-learners last school year, and 99 percent of students were people of color. Just 40 percent of ICHS students graduate within four years, and statistics show that sports could make a difference. A recent study from the University of Kansas found that high school athletes are more likely to graduate: “When a student has to earn the right to play a sport by performing in the classroom, that is a very strong factor in keeping adolescents in school,” one of the researchers told The Atlantic. During his first year on the job Garcia-Rosen tried—and failed—to secure funding directly from the Public School Athletic League (PSAL), the division of the NYC Department of Education (DOE) that administers sports programming for public school students. Like many small schools, ICHS did not meet certain PSAL standards for funding, including, “the perceived level of interest at the school, availability of coaches, and enough students who could satisfy the league’s academic eligibility rules,” according to the New York Times. “They made it pretty clear we shouldn’t even bother applying,” Garcia-Rosen says. At that point he switched tactics. In the fall of 2011 he organized a separate league for small schools, called the Small School Athletic League (SSAL). It was principal-funded, meaning the league’s money came out of individual schools’ budgets rather than the PSAL. It was intended to be a pilot league to show the DOE that it was feasible and that there was demand for sports in small schools. At its peak, during the 2013-2014 school year, 42 small schools participated in the SSAL, with 1,700 student athletes. Garcia-Rosen coached ICHS’s baseball team, which won two league championships. Also during this time, Garcia-Rosen started looking into how DOE resources are distributed for sports programs in New York City’s public schools. As he dug into the numbers, he noticed trends by borough, race, socio-economic background and English-learner status. “Every single type that I ran and every way that I ran the data, had the same exact outcome,” he said. “Schools that had more students of color had less sports opportunities, schools that had more poverty had less sports opportunity. Schools that had more English language learners had less sports opportunities.” In fact, New York City schools with predominantly white student bodies have more than double the number of PSAL sports teams: eighteen on average compared to seven. Garcia-Rosen brought these findings to administrators, demanding that methods of allocation be changed. He asked for the creation of a separate line item in the budget for small school athletics, that the data collected in his campaign be used to advocate for additional funds to expand access to interscholastic sports and for small schools to receive the same level of funding as other PSAL teams. After numerous meetings over several months, he says the DOE offered him a job to run the SSAL under the PSAL umbrella, but he rejected the offer because they would not guarantee that his demands would be met. When the internal battle seemed doomed, he brought the fight up the ladder and into the public eye. In May of last year, he submitted an official complaint to the federal Department of Education alleging that the way funds are distributed is in violation of the Civil Rights Act of 1964. He is still awaiting a response. Also in May, after the students staged their first budget hearing interruption, the DOE allocated $825,000 to the SSAL for the 2014-2015 school year. With the new allocation, Garcia-Rosen’s small school league was absorbed by the PSAL. Any sense of victory that Garcia-Rosen and his allies felt soon evaporated: his school lost baseball, softball and soccer, which were replaced by table tennis. At this point, table tennis is the only sport offered to boys at ICHS. Girls have two options: volleyball and basketball. In an email statement, DOE spokesman Jason Fink wrote that the department has created 109 teams for the Small School Athletic League. The SSAL includes a Developmental Division for new teams at any school, large or small, and the Multiple Pathways League. “Demonstrating our commitment to meeting the needs of all students, we have created the Multiple Pathways League…as a component of the SSAL,” he wrote. “The MPL has modified academic eligibility standards, and is geared to meeting the needs of students who are over age and under credited, as well as English Language Learners.” Despite this, by Garcia-Rosen’s count, the number of teams at small schools that had participated in his league has been slashed from 84 to 24. This March, like last year, Garcia-Rosen and his students disrupted Chancellor Fariña’s testimony during budget hearings. On March 25, some 50 ICHS students stormed the hearings along with Garcia-Rosen and two faculty members. The protest was the culmination of months of planning, with the hopes that funds will be distributed in an equitable manner and that every high school will have at least six teams. The next day, Garcia-Rosen and the two other faculty leaders were removed from the school and relocated to union headquarters downtown. “It’s like being in suspension for teachers,” Garcia-Rosen says. In an email statement, the DOE says the reassignment is a result of a misconduct investigation. Garcia-Rosen has been told that the investigation itself could take up to a year, and he hasn’t been given details on what exactly he is being investigated for. “Obviously we can figure out what the charges are on one level: we protested on Wednesday, we were removed on Thursday,” he says. Indeed, the day before the protest, the school’s principal, Berena Cabarcas, sent an all-staff memo with a reminder that the School Chancellor’s Regulations state that any unauthorized absence, which includes political activity, would result in the termination of employment, according to a document obtained by The Nation. “The argument I would make is that standing side-by-side with my students that are organizing and advocating for their civil rights is not exactly a political campaign,” says Garcia-Rosen. All three removed faculty were at the recent Wednesday rally. Every public official that they stopped, four in two hours, made similar promises. Until those promises are fulfilled, Garcia-Rosen and his former students will continue to meet, plan and protest each Wednesday. Maura EwingMaura Ewing is a Brooklyn-based journalist. Her work has appeared in Al Jazeera America, Salon and Narratively, among other outlets. Follow her @mauraewing.